If you’re in the valley at all today AVOID the 118 Fwy. There are two fires burning out of control in the area and the freeway is shut down in both directions from Simi Valley to Reseda Blvd. Police are now evacuating Porter Ranch. I was in West Hills this morning for an appointment and snapped this pick of the fires. Air quality is really bad and forced the cancellation of classes at Cal State Northridge for the rest of today. BE CAREFUL OUT THERE!! Today’s Monday Mixtape feature is being postponed until I can get all my files transfered over from my work computer to my home laptop. All my new music files were on my work computer so all I have here are the classics that would get me in hot water with the RIAA. In the meantime enjoy Mouse’s Review of Rademacher‘s ERA EP out now on our very own JAXART label. The band will be playing at the Echo TONIGHT with Wrong Way Driver, The Transmissions, and Eagle and Talon. Click here to buy on iTunes or Click here to buy on eMUSIC. I apologize for my lack of posting over the past few days. Needless to say I’ve been insanely busy. I wanted to let you know I haven’t forgotten about all of you and in fact I miss you like crazy! 1. Rademacher are playing at The Echo on TOMORROW with The Transmisisons, Eagle and Talon and, and Wrong Way Driver. Admission is free and there will be $3 Dewar’s Drinks all night long. 3.) Go see No Age and The Movies for a good cause. Read all the details below! Man is it an interesting time for everyone – a lot of unwanted change, rocky beginnings, and financial woes that seem to be slowly draining the hope out of our nation. I’d like to start off by saying I do not consider myself a political person WHATSOEVER. I try to focus on music and spreading the joy it brings. But right now our country is in a state of TREMENDOUS turmoil and change. I myself have felt the affects. In the middle of paying off ridiculous medical bills even though I had insurance I was laid off from my job and watched my life savings dwindle more than 40% in just 2 weeks. I’m 24 and will bounce back but try telling that to my parents and grandparents who are experienecing the exact same crisis alongside MILLIONS of other Americans. We are all victims of he mismanagement of this country and in the less than a month the decision will be ours to vote for positive change or to continue to do nothing to stop the painful economic and social decline that is now invading every facet of our lives. My message is simple. PLEASE VOTE. There are many great organizations like Rock The Vote that can assist you in your registration. If long lines at the polls are dissuading you from voting you have another option. If you live in the state of California you cast your vote early. Find more information about it here. What a happy Wednesday morning! I woke up early to move my car and have been having a pleasant morning sipping coffee, putting away all the affects from my old office and listening to Glenn Campbell. It really doesn’t get any better than this. I am going to be out and about the majority of the day so I though I would drop you a quick MP3. Over at RCRD LBL they have an exclusive download for Cold War Kids track – Bullies Always Win. Somehow I related the title of this track to my current situation and felt the need to share. The song was previously only available with album pre-order and is on a UK 7″ but hasnt been available in the US until now. Loyalty To Loyalty is available now. The record is fantastic. I highly suggest picking it up. Well if you missed The Henry Clay People‘s near capacity CD release show at Spaceland last Friday you certainly missed a piece of Los Angeles history. Good thing Rock Insider photographer Benjamin Hoste was there to catch all the action. The Clays played all new material off their new album For Cheap or For Free (read my review here) and threw one stinkin’ hell of a party. I wont get into the specifics. For that check out Mouse over at Classical Geek Theater’s review of the show. Check out photos of The Henry Clay People and The Parson Redheads from Fridays show below. Just wanted to let you all know that Rademacher‘s residency kicks off TONIGHT at the Echo! The Broken Remotes, Radars To The Sky, and Light FM will all be performing so it should be a great night!!! I would like to thank the U.S. economy, George Bush, and all the other people out there who made my bid to collect unemployment insurance possible. Detour and Eagle Rock Music Festivals Take Over Los Angeles TOMORROW! TOMORROW is going to be absolutely insane. LA Weekly’s Detour Music Festival will be taking over downtown Los Angeles with performances from Gogol Bordello, The Mars Volta, Data Rock, Cut Copy and more. Meanwhile on the other side of the hill The Eagle Rock Music Festival will showcase over 60 of the best up and coming underground bands from across LA with performances from Crystal Antlers, Abe Vigoda, Light FM, Pizza!, Earlimart, The Flying Tourbillon Ochestra and Divisadero to name a few. I’m going to be pulling double duty by doing BOTH festivals. As you may may remember The Monolators won the Detour Festival Battle of the Bands Competition and will be opening up the main stage at 12:45pm SHARP. 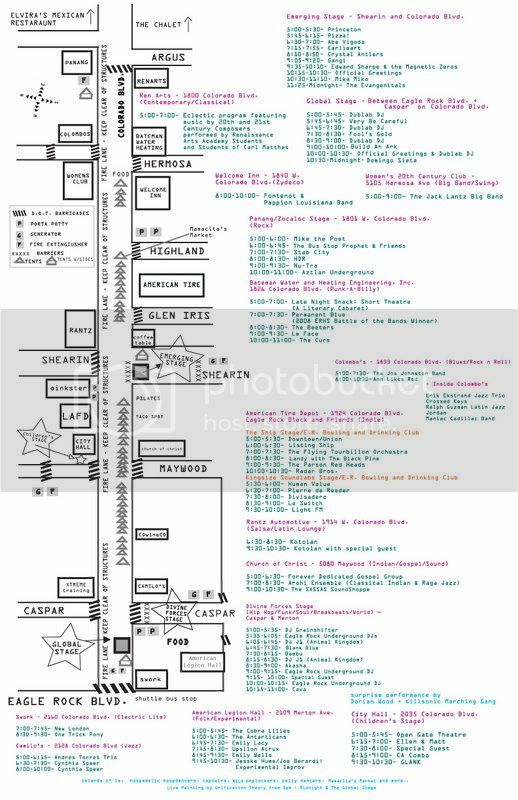 After we perform we will be high tailing it over to the Eagle Rock Music Festival to perform with The Cobra Lilies – which features 3/4 Monolators as well as members of Divisadero, Amateurs, Smells Like Flan, and Ema and The Ghosts. So which festival is better? I think it’s a case of different strokes for different folks. The biggest difference between the two festivals: tickets to Detour are over $40 dollars while admission to the Eagle Rock Music Festival is completely and totally FREE OF CHARGE. Regardless – YOU HAVE NO EXCUSE FOR NOT GOING OUT TO SEE LIVE MUSIC TOMORROW!!!! to plan your trip and save some gas money. View festival map right here. Doug Henry, and others to be announced. Is the weekend here yet? Oh man Tomorrow is going to rock with BOTH Detour Festival and the Eagle Rock Music Festival taking over Los Angeles. More on that later. For now enjoy these excellent photos of The Damselles and I Make This Sound from Silverlake Lounge last night. For the few of you who didn’t go see MBV last night – The Voyeurs played at Spaceland with The Minor Canon for Club NME. I unfortunately couldn’t attend due to band rehearsal and trip down to Long Beach but Rock Insider photog Benjamin Hoste was there to capture all the action. Check out photos below! Long Beach readers catch them live at Que Sera October 8th with The Flying Tourbillon Orchestra. All photos by Benjamin Hoste. 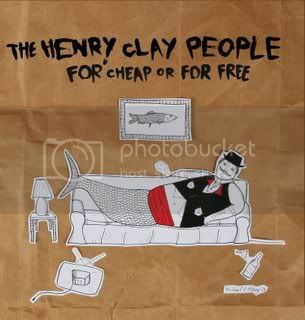 I haven’t chimed in yet on just how fabulous the new Henry Clay People full length – For Cheap Or For Free because I am obviously biased. As you may remember I released a 7″ vinyl single for the band’s track ” Working Part Time” in March of this year on JAXART Records (plug: buy it here please). My admiration for this band began with Blacklist The Kid With The Red Mustache and continues to this day. Their rawkus live performances always seem to out-do the ones prior and it’s impossible not to fall in love with their anthemic narrative tunes that everyone can relate to. For Cheap Or For Free is definitely a record for for the masses ESPECIALLY in our current economic state. For Cheap Or For Free has songs about everything from being broke, to being frustrated, to being drunk, and struggling to get buy . The album is a perfect time capsule that I believe will go down as one of the definitive records for the East Los Angeles Music Scene. For Cheap Or For Free includes the majority of tracks from their “Working Part Time” EP released earlier this year plus several live favorites including “Bull Through” and “Fine Print.” Seriously though, It doesn’t get any better than “This Ain’t A Scene” – which already has my vote for “Song Of The Year” PERIOD. The Henry Clay People will celebrate their record release TOMORROW NIGHT at Spaceland with good friends The Parson Red Heads, Le Switch, and the absolutely FABULOUS Downtown/Union. Pick up their new record at the show on Friday. The album will be available on iTUNES in November! You can also catch singer/guitarist Joey Siara and Keyboardist Jillinda Palmer performing with The Monolators this Saturday at LA Weekly’s Detour Fest. Monolators play at 12:45pm sharp!!! Don’t forget – you can still pick up a copy of their limited edition “Working Part Time” 7″ Vinyl Single w/ Digital EP for just $7 bucks in the JAXART Store. OK, I have to give Katy Perry props. This video is deliciously fabulous. It reminds me of back when MTV actually played videos. The narrative tale of a bride out for revenge on her hot and cold would be life partner is absolutely entertaining. Dudes and dudettes, there’s even a dance number with wedding dresses and baseball bats and break dancers. Its over the top pop genius. What’s up happy peeps. I hope y’all are having just as fabulous a day as I am having. To help you feel slightly more chipper Spaceland gave me a 2 pairs of tickets to give away for the Wednesdays Club NME night with The Voyeurs and The Minor Canon. If you haven’t seen either band yet you’re doing yourself a great disservice. email jax@rockinsider.com to enter. Please put SPACELAND TICKETS in the subject line. First two to respond win! Rademacher ERA EP Available TODAY on JAXART Records! Rademacher‘s new ERA EP is available everywhere TODAY on JAXART Records! Pick up the album oon iTUNES and eMUSIC now!! Also don’t forget, Rademacher‘s Residency at The Echo begins NEXT Monday, October 6th, with Light FM, Radars To the Sky, and The Broken Remotes performing. Full residency schedule is below! Hope to see you out and about! The Echo really feels like the place to be tonight. Especially since my 401K plan pretty much went NON-existent this afternoon and I’ll be spending my golden years flipping burgers under some golden arches. I’m certainly in the mood for some FREE entertainment and cheap drinks- especially when it’s among some good friends and cool people. 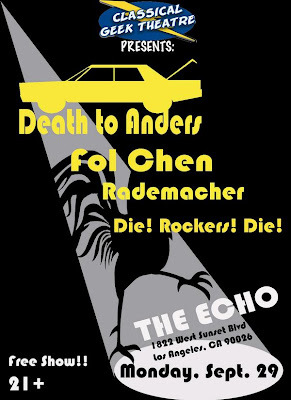 Rademacher will be performing at The Echo TONIGHT as part of Death to Anders BIG RESIDENCY BLOWOUT w/ Fol Chen and Die! Rockers Die! Rademacher‘s new ERA EP will be available TOMORRROW via Rock Insider’s little label the could – JAXART Records. Be sure to pick it up on iTUNES, eMUSIC, or Rhapsody! I have a bad feeling it’s just getting started. Stocks skidded this afternoon, with the Dow’s nearly 778-point drop being the worst single-day point loss ever, after the House rejected the government’s $700 billion bank bailout plan. Oasis Just announced the US Leg of their “Dig Out Your Soul” Tour with Ryan Adams. The band will be playing the Staples Center on December 4th. Tickets go on sale October 3rd at 10AM. For a limited time, every Oasis ticket order made through Ticketmaster, comes with the option to upgrade to a special package containing your concert ticket, the brand new “Dig Out Your Soul” cd, and an exclusive Oasis t-shirt available ONLY in this promotion. Not to be confused with with Crystal Antlers, The Antlers hail from Brooklyn NY. They are of the subdued pensive ambient variety but still manage to pack a mean punch with great builds and layers of acoustic intruments and delicious drone. Listen to “Two” below. It’s perfect for listening for the fall. The Antlers will be going on an east coast tour leading up to CMJ. Dates are listed below!! TONIGHT The Western States Motel will be playing a FREE EP Release show at Safari Sam’s with Light FM, The French Semester, and The Secret 6. The show will be hosted by KROQ Locals Only and Scion. listen to “Oh World” off the new EP on the band’s myspace page. Megapuss, Entrance, Little Joy @ The Troubadour – Megapuss is a indie rock super group featuring Devendra Banhart and Fab Moretti of The Strokes is behind Little Joy. On a side note: best album artwork EVER. I get soo many MP3s in the mail that I never seem to post. Why should you guys suffer the pains of being MP3 deprived!!! Check out a few of the best from this week below! From Eulogies upcoming Vinyl + Digital EP Tempting To Do Nothing (hmm interesting concept. wondering where they got that idea). The record is out October 7th. The track above features the lovely voice of Nikki from Silversun Pickups. New full length will be out this fall! This track makes me want to break out my GoGo’s records. Also a little bit of Cramps influence in here as well. I first wrote about Listing Ship on Rock Insider 3 years ago (DAMN has it really been that long!). Such great strings on these recording!! They just released a new full length entitled A Hull Full of Oil and Bone and will be performing at pehrspacee Oct 9th. Its so fitting that a band from Brooklyn would name their album and on of its tracks after the burrough they hold so dear. Creaky Boards are a fine example of this piano clackety rock. If you like Le Switch you will love this. Yes that really is their band name. cheeck out there myspace page here. GREAT southern rock n’ roll along the lines of Rolling Blackouts and Rosewood Thieves. Massive guitar solos in this track.